The Declaration includes both Individual Assistance and Public Assistance to help people and communities recover from Typhoon Mangkhut. Individual Assistance is provided by FEMA directly to eligible individuals and families who have sustained losses due to disasters. 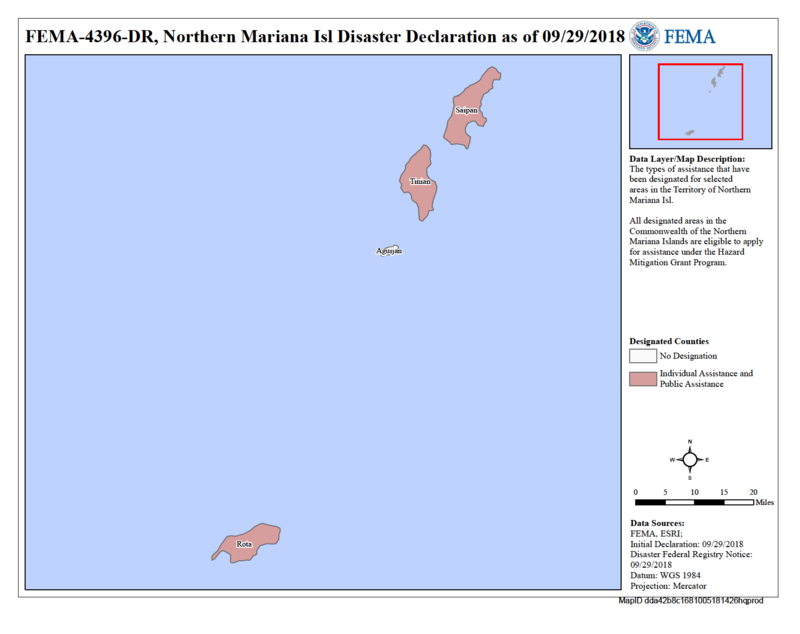 Homeowners and renters on the islands of Rota, Saipan and Tinian who sustained damage to their primary homes, vehicles and personal property as a result of Typhoon Mangkhut may apply for disaster assistance. Disaster assistance may include grants to help pay for temporary housing to include rental and lodging expense, emergency home repairs, uninsured and underinsured personal property losses, and medical, dental and funeral expenses caused by the disaster, along with other serious disaster-related expenses. Disaster assistance grants are not taxable income and will not affect eligibility for Social Security, Medicaid, medical waiver programs, welfare assistance, Temporary Assistance for Needy Families, food stamps, Supplemental Security Income or Social Security Disability Insurance. Low-interest disaster loans from the Small Business Administration (SBA) may be available for businesses of all sizes (including landlords), private non-profit organizations, homeowners and renters. Low-interest disaster loans help fund repairs or rebuilding efforts and cover the cost of replacing lost or disaster-damaged real estate and personal property. Economic Injury disaster loans are available to businesses and private nonprofits to assist with working capital needs as a direct result of the disaster. Federal assistance is geared towards residents who incurred uninsured losses specifically related to Typhoon Mangkhut. A home inspection is part of the eligibility process. Residents will be contacted shortly after registration to arrange home inspection appointments. The *best* method to register for disaster assistance in the CNMI is by visiting your nearest Disaster Recovery Center to ensure accurate physical addresses are reflected in FEMA’s system. In addition to providing opportunities to register for disaster assistance, DRCs provide a location for disaster survivors to check the status of their applications, to submit documentation and to speak with representatives from other agencies that assist in disaster recovery, such as the Small Business Administration.